My last hurrah on this trip to Tokyo came at the suggestion of my good friend Nick’s brother Tom, who forsook the north of England for the Japanese capital some six years ago. Taking the train north and slightly east from Ginza brought us to Ryogoku, home of Tokyo’s sumo stadium and many of its training “stables”. While I couldn’t have my fix of Japan’s national sport (“living history” is an equally good descriptor for sumo) on this occasion, as the season was over, I was able to refresh myself in what must be among the most memorable beer establishments I experienced on this trip: the oddly-named but exceptional Popeye bar. 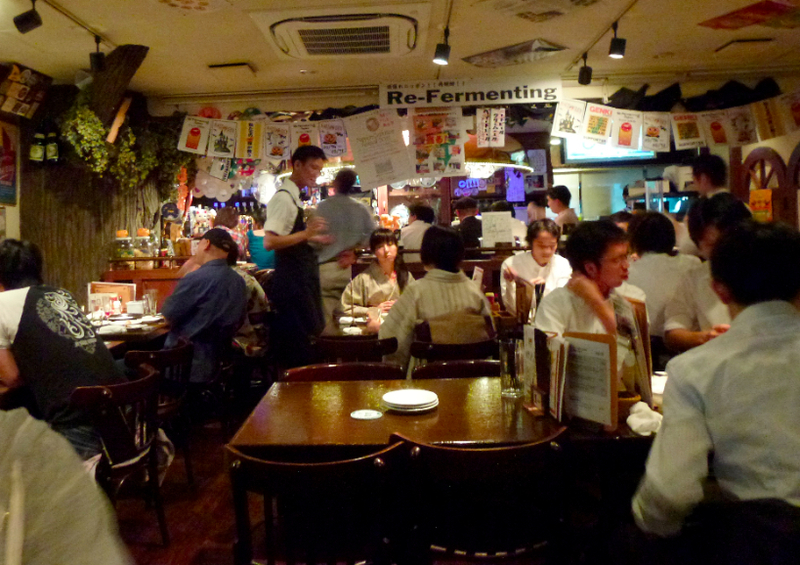 Thankfully free from too many cartoon memorabilia and references, Popeye offers perhaps the best selection of Japan-brewed micros in any pub in the country, preferring to focus on local brews (upwards of 70) and draughts over imports. Moreover, the owners clearly delight in the variety that beer has to offer, with a well-thought out list catering for all kinds of tastes and styles (daily beer menu here). Prices again required a deep breath before ordering but the opportunity presented meant I was more prepared to indulge than I would be in a similar situation back home. 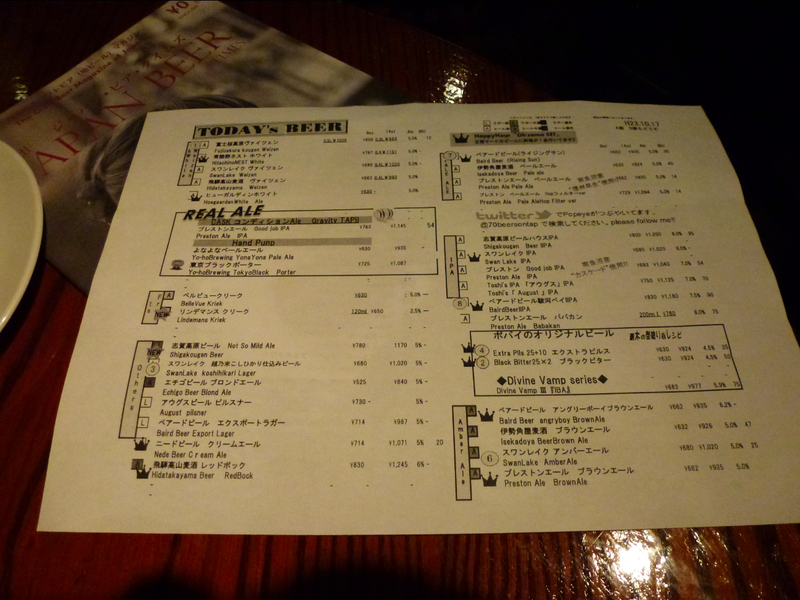 During the course of a fun couple of hours or so, Tom and I worked our way through a decent selection of draughts, including – surprisingly, although it appears some Japanese micros have been doing it for a while now – two cask-conditioned “real ales”. 1) Swan Lake Koshihikari Lager: Very pale, hazy, probably unfiltered and possibly unpasteurised lager with a soft yeasty but reasonably hoppy flavour. The fact it is made with rice might put one in mind of a famous American beer but this is certainly no Budweiser. Swan Lake beers are the product of Hyouko Yashiki No Mori Brewery in Niigata, north of Tokyo on the opposite coast. 2) Preston Ale Good Job IPA: Well-balanced if not too challenging deep golden cask pale ale served by gravity dispense from the barrel, a bit hazy but otherwise good condition. Quite a surprise, if a bit underhopped. Preston Ales are a product of the Joyful Honda “lifestyle” company’s microbrewery in its one-company shopping mall in Utsonomiya, Tochigi Prefecture north of Tokyo. 3) Yo-Ho Brewing Tokyo Black Porter (5%): Very solid hand-pulled, cask porter, with good bitterness and roasty flavours balancing rich dark malts. Tokyo Black has made occasional appearances in the UK (GBBF anyone?) so represents one of the better opportunities for UK drinkers to sample Japanese craft beer. Yo-Ho Brewing is situated in Karuizawa, Nagano Prefecture norht west of Tokyo and is known as a pioneer of “real ale in a can”. 4) Baird Beer Angry Boy Brown Ale (6.2%): Described as English style but obviously American influenced, Angry Boy offers an expressive, spicy and fairly dry brown ale. Described by the brewery as “keg conditioned” although the description sounds little different from cask conditioning with the exception of the keg-style dispense tap. Baird Brewing Company is based in Numazu, Shizuoka Prefecture south west of Tokyo. Each of the breweries sampled on this short adventure offers many more interesting brews that would be worth trying. I actually have a bottle Angry Boy Brown Ale acquired at this year’s Great British Beer Festival so I’m looking forward to reacquainting myself with this beer under more neutral sampling conditions at home. I also bought a couple of more experimental brews at the same event under the Hitachino Nest brand from the Kiuchi Brewery in Naka-shi, Ibaraki. More on those when the time comes to sample them. Certainly the enthusiasm for microbrewing in Japan has been eye-opening, especially the commitment to serving beer as naturally as possible. While there’s still room for improvement in the Japanese scene, especially in terms of more mainstream outlets, there’s also lots to be excited about. And to wish for a rapid return on my part to pick up where I left off. The Alternative Tipple Create a free website or blog at WordPress.com.